Is My Web Server Too Slow? What Is “Too Slow” and Why Does it Matter? Widely available research tells us that, variously, half of Internet users will leave a web page if they’re not hooked within three seconds, or two seconds… The longest I’ve come a cross is eight seconds. So, taking the easiest target, if your web page takes 8 seconds to load, half of your potential customers will have already left by the time it appears. With average conversion rates of 1% or less, that means you need over 100 clicks on your ad to get one person interested. And remember, this is just interested, not a real customer by a long way. So, 8 seconds is far too slow. NB: 8 seconds covers both server response time and page load time. Try 2 or 3 seconds instead for the server alone. “ping” is a command we use to monitor clients’ server up-times. Handily, it also tells you how long it took to send a tiny packet of data across the Internet and receive a reply. 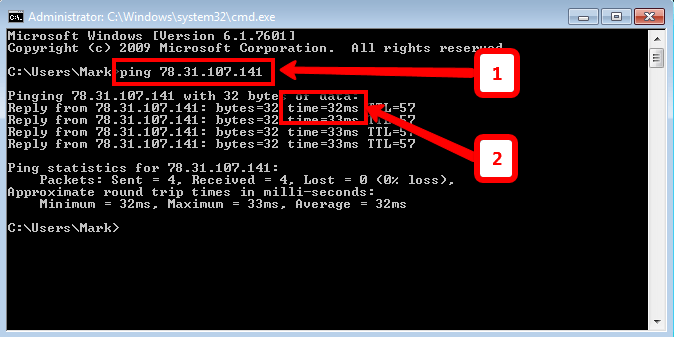 You need to know your web site’s IP address, and how to use a command prompt. I use Windows 7, so I click the Start button and type cmd into the search field. This is the old DOS window, for anyone who can remember that far back. At the command prompt, type ping, followed by your website’s IP Address, followed by Enter or Return. E.g. “ping 78.31.107.141”. You see the time our server took to respond, 32 milliseconds. To close the cmd window, type “exit”. Fortunately, there is an better way. Pingdom is a service provided by a Swedish company. It tracks website performance and downtime. Not only does it take away all the hassle, it also keeps history, and shows charts of your site’s performance over time. It’s free for occasional use on a single website. Set up an account, log in, and identify your website for checking. Let it run for a day or more. Log in to your dashboard, where you can see an up-to-date summary: down-time and server response time. This shows there’s been no downtime over the last 24 hours, and the response time was fine too, average 386 milliseconds. That’s very good. Click the icon I’ve indicated “choose report” and select Response Time. NB: this chart comes from a different website, which we won’t name. It shows hourly average response times on Feb 6, from 00:01 hours to 24:00. You can see that, after 6pm or so, response time was OK, well below half a second. However, all through the working day it took over 3 seconds just to get a response from the server. You can hover over a point on the graph and Pingdom displays the detail (white box, top of picture). This is not a good result. Sadly, this website’s graph looks similar every day. Users are losing interest. Try Pingdom’s free tool on your own website! Go to their website and click Get Started Now. TIP. Several people with whom I’ve discussed Pingdom had trouble logging out of their account for the first time. It isn’t dead obvious how to do it. Look for the “on/off” symbol, towards the top of the screen, to the right of your login name. Being yellow, it’s hard to spot, but it turns red when you hover over it. OK, we’re talking about the carriers, here, everything that happens between your browser and the website you want to view. We covered the website’s contribution in an earlier post. There are two main components: the speed of your Internet connection and the time it takes the web server wake up, find the web page you requested, and send it back. Because Pingdom pings from a fast Internet connection, we can ignore the download speed issue. If Pingdom sales a site is slow,then it’s on a slow server. If Pingdom says the site is OK, and the ping command from your own device shows a slow response time, then your Internet connection is the problem. Step 2: How do you find an ISP with satisfactory performance? We need to stress that most web hosts, most of the time, will provide satisfactory performance. You might suffer a bit at peak usage times, but that’s all. Here’s a good way to find one. If they’re not OK, point them at this post ;-). You could also look at PC Pro’s annual web hosting awards and pick one from around the top of the list. This entry was posted in Digital Marketing, Website design and usability and tagged page load speed, SEO on March 18, 2014 by Dave Fielden.